Tinted Base (Original) has a beautiful built in camouflage (think BB Cream). The tint in the BASE helps you to see where you are applying it and helps to camouflage any imperfections that the natural nail may have. Shimmer Base (NEW!) has a beautiful built in white shimmer. It also helps to hide imperfections and adds some beautiful sparkle. Looks stunning under the Wildflowers Clear Build in a Bottle. Clear Base (NEW!) is a traditional clear base coat. 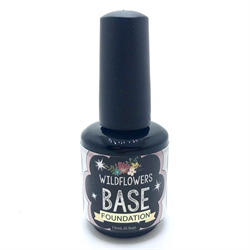 The Wildflowers BASE gel is necessary if you plan to soak off either Wildflowers Build in a Bottle or Wildflowers Sculpting Paste. Apply a thin coat of Wildflowers BASE gel. Cure for 30 seconds in an LED lamp or 120 seconds in a UV lamp. Apply a second coat for camouflage coverage. Cure. Continue to sculpt your nails using Wildflowers Build in a Bottle, or Wildflowers Sculpting Paste OR finish with Wildflowers Top Coat Gel for a natural nail overlay.